The world has not seen a new class of antibiotics in the past 27 years. And bacteria are increasingly becoming resistant to the existing group of antibiotics. Now a group of Boston-based researchers claim to have finally discovered a new drug, which they call teixobactin. Better still, the technology developed by these researchers could pave the way for the discovery of many new classes of antibiotics. Microbiologists develop antibiotics by studying the molecules that soil microbes naturally make to fend off their competitors. The trouble, however, is that only about one per cent of the microbes can be reliably grown under lab conditions. This means scientists, so far, have not been able to study the remaining 99 per cent. The team of scientists, led by Kim Lewis from Northeastern University in Boston, Massachusetts, has invented a device that can successfully grow uncultured microbes in labs. 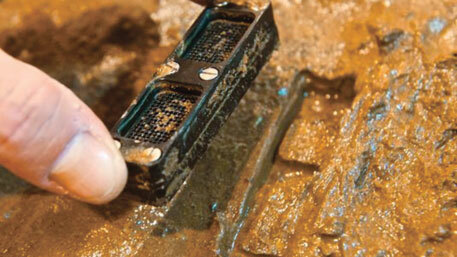 iChip is a simple device with 96 chambers that are used to isolate and grow bacteria. “We had a sense that we are not smart enough to grow these bacteria in lab settings, so we decided to grow them in natural settings,” Lewis said. 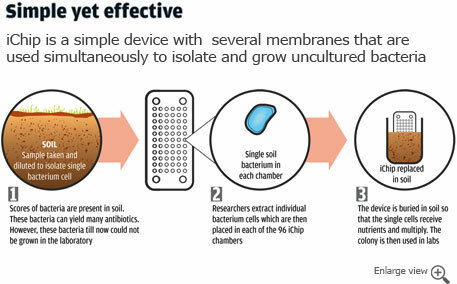 The team first diluted the soil to isolate a single bacterial cell from it. Then the cell was inserted in one of the chambers and the device was placed back in the soil so that the cell received nutrients and grew naturally. After a while, the chamber had a colony of bacterial cells that were studied in the lab. 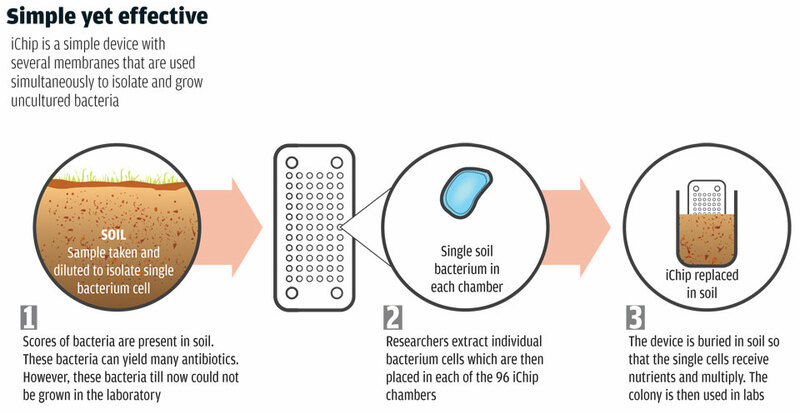 The researchers claim that generally one per cent of microbes in a soil sample are able to grow in the lab, but iChip expands this to 50 per cent. The finding was published in Nature on January 7, 2015. With the help of iChip, the researchers tested almost 10,000 bacteria to find molecules that can limit the growth of superbug Staphylococcus aureus, which is frequently found in the human respiratory tract and on the skin. They found 25 potential antibiotics, of which teixobactin was the most important. The new antibiotic killed the bacteria by preventing them from building their outer coats. And more importantly, when the researchers tried to deliberately evolve strains of bacteria that resist the drug, they failed. The researchers used the antibiotic to successfully treat mice infected with Staphylococcus aureus, which causes skin, blood and lung infection. The antibiotic also successfully killed strains of bacteria that causes tuberculosis. The new antibiotic attacks only gram-positive bacteria, which have a thick cell wall but lack an outer membrane and cause diseases such as diphtheria and tetanus. Gram-negative bacteria are further protected by an outer membrane and this makes them insensitive to the antibiotic. The last antibiotic was found in 1987. Indiscriminate use of antibiotics has caused bacteria resistance, which has been a big concern for microbiologists world over. Alexander Fleming, who discovered the first antibiotic, penicillin, in 1928 had warned against drug resistance. The discovery has special importance for India and other developing countries that are worst hit by superbugs. The World Health Organization has highlighted that 50 per cent of the total drug-resistant cases of tuberculosis live in India, China and Russia. A research done by Timothy Walsh, a medical microbiologist at Cardiff University, UK, has found that more than 95 per cent of adults in India and Pakistan have bacteria that are resistant to ß-lactam antibiotics, which is the most effective antibiotic available today. The team says it will take at least a few more years before the antibiotic can be tested on humans. Praytoosh Shukla, general secretary of the Association of Microbiologist of India, says teixobactin antibiotic will play a great role in finding solutions to diseases which are drug-resistant such as tuberculosis and blood infection. He says the method is simple and can be used by researchers globally to find out more antibiotics. McMaster Uni­ver­sity professor Gerard Wright, in a separate paper published in Nature, says that while it remains to be seen whether other mech­a­nisms for resis­tance against teixobactin exist in the envi­ron­ment, the team’s work could lead to identifying other antibiotics that will be more resilient to bacteria. The initial results of iChip are definitely promising. But there needs to be a lot more research to ensure that it delivers.